During larger sewing projects, I often take a break and make quick little items, either out of need of the item itself or just for want of some instant gratification. These are a few recent projects that I especially liked. After our large post-it notepad ran out, I made a fancy new grocery list notebook. 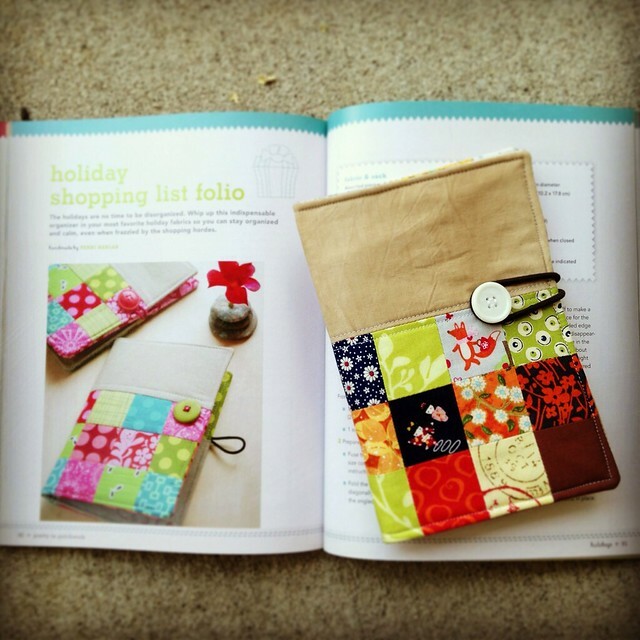 The pattern is from Pretty in Patchwork Holidays by John Q. Adams. I bought this book to read over vacation and I just LOVED it. I’m not much of a “holiday” person, but many of the projects don’t have to be holiday specific. There’s a “read between the lines” pillow that I’ll probably end up making, too. 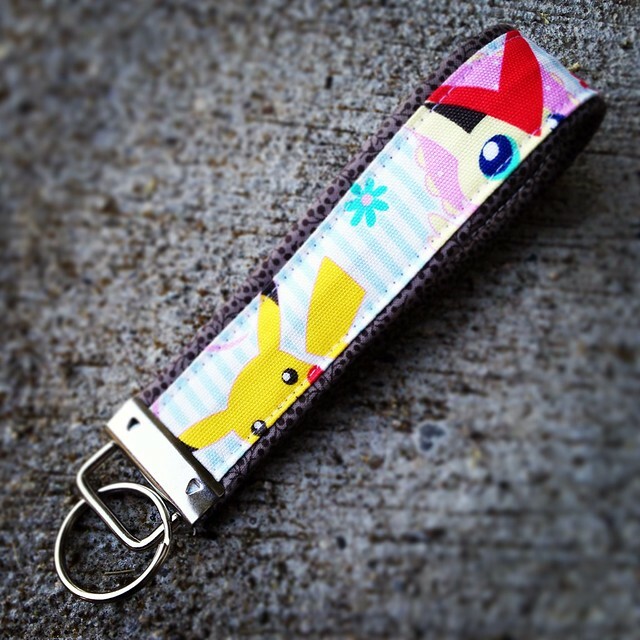 My older daughter specifically asked for a Pokemon key fob. (Instructions for making key fobs found here.) I was happy that even if she’s grown up, she’s not that grown up. Love the little peeking Pokey faces! I know I saw chickie coin purses when searching for vacation reading materials, but I can’t remember where! 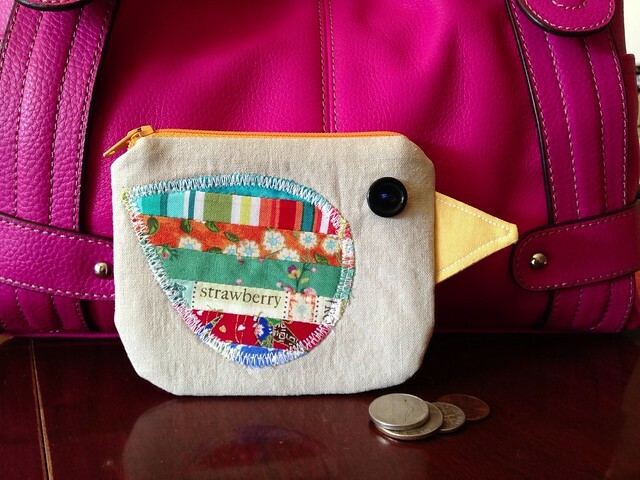 It did inspire my own coin purse though. And I’ll probably be looking for that book again, because it was full of cute stuff. This last one is a continuing project. A friend of mine recently lost her husband, and I just can’t stand it for her. She took a picture days before, when she was beside him, of the sun breaking through the clouds. It brought her comfort to have that picture, so I am attempting to recreate it somewhat. But instead of trying to have a literal copy of the picture, I’ve changed it to hexies/English paper piecing to “pixelize” her picture. The plan is that from up close it makes no sense, but from a distance you’ll be able to bring it into focus. Someday, I trust that we’ll be able to step back and see more clearly the things that just haven’t made sense here. This is the lower left section, with nine more rows needed to mostly finish the left half. (The larger sections will still need to be stitched together.) The right side will bring in the sun and its reflection on the water below. And I still don’t know what this hexie-picture will be — a wall hanging? Small quilt? I’m just trusting it will be what it needs to be, too. My kids are going to love the key fabs. Pokeman anything is always a winner. Thanks for the idea! 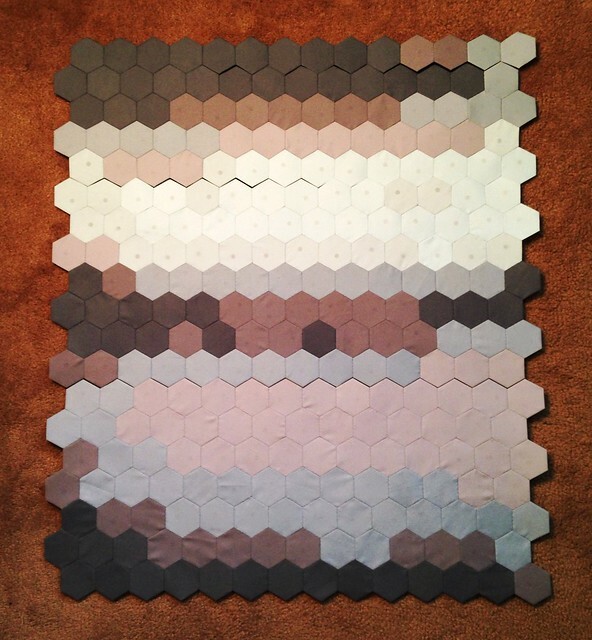 I’d opt for a wall hanging for the hexie project. I would’ve loved to have something like that when I lost my husband, but I didn’t sew then, and didn’t know anybody who did. You’re a good friend to do this for her. Thanks, Laura! And imagine how easy it would be to make a bear, cat, dog … all kinds of animal pouches!